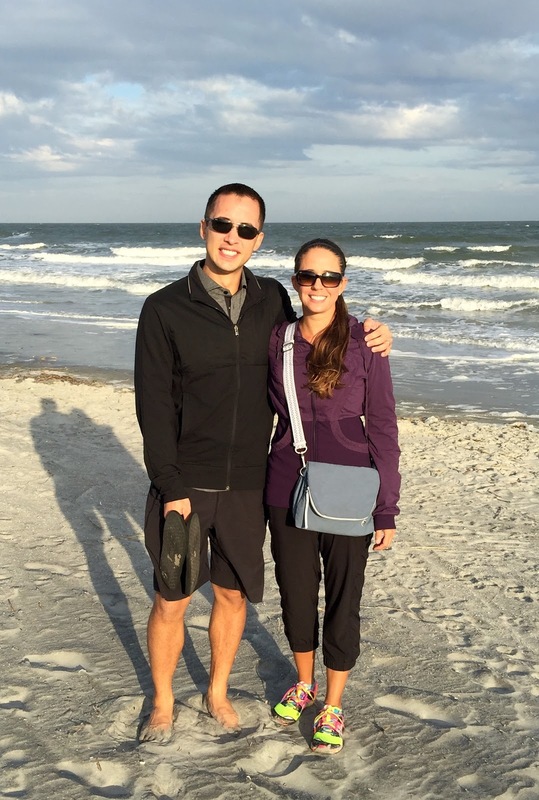 Andrea and I drove to Hilton Head for a weekend of relaxation and tennis. We were excited to do a bunch of tennis clinics and maybe do some round robin. We had quite a bit scheduled, but unfortunately the tennis was cut short on the first day. I was up at the net, getting ready to hit a volley, but the ball took an unexpected bounce off the net and then went directly into my left eye. I dropped to the ground, punched the clay a few times, then got up and walked off the court. Andrea helped me get some ice to put on my eye and then she found a local eye doctor that was open. We drove over and had a thorough and painful eye exam. I had a pretty bad abrasion on the cornea and the doctor also had to pick out green tennis fuzz with tweezers. She put some drops in my eye to dilate it and while we were waiting for it to take effect she got ready to check whether my retina was detached. I asked her what would need to be done if it was detached and she started to describe how they'd use some kind of "nail" to anchor it back in place. I had to stop her at that point because I was feeling really dizzy and I got really light headed. I had to close my eyes for a bit and it sounded like Andrea was really far away while she shook my arm and said my name. Eventually I felt a little better and had to lie down on the floor for a minute to get my composure back. The doctor was very patient with me and once my eye was dilated properly she looked in it from all kinds of angles and thankfully said that it looked ok. I was terrified that I'd lost vision in my eye forever at one point, so although I was in quite a bit of pain and had to wear a bandage contact, I was happy that things looked like they'd heal. 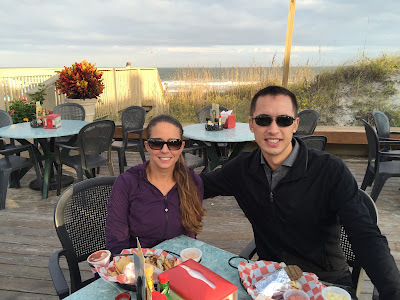 We spent the rest of the day relaxing and ate some lunch and then dinner out. The next morning I went to Andrea's tennis clinic and afterwards went back to the doctor for a follow up appointment. She changed my bandage contact and checked to make sure everything was healing ok. She recommended I see a doctor when I got home to remove the bandage contact and be sure everything continued to heal. 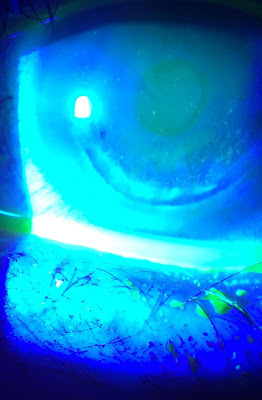 She put some dye in my eye and then took a picture with my phone so the doctor would be able to see where the abrasion was. In the picture, it's the crescent shaped area at the bottom of the cornea. It was a fun weekend to spend with Andrea and we enjoyed our time together, although we didn't play as much tennis as we'd hoped. It was neat to explore the area and to eat at the local restaurants. We will probably go back, and hopefully will get to do more tennis together next time.